If the sizes of the moons are expressed relative to their primary (the planet they orbit) there are still more surprises. The moons of the planets in our solar system are spectacularly varied. From huge worlds capable of retaining a dense, smog-filled atmosphere to tiny, airless rock-balls in bizarre orbits, they harbour frozen oceans, sulphurous volcanoes and rivers of ammonia. Here are the largest of them, shown at their correct relative sizes. 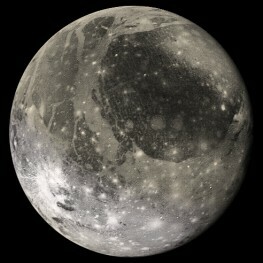 ganymede, third out of Jupiter's Galilean moons, is mostly made up of rocky silicates with a small molten iron core. Its icy crust is a mix of very old, dark areas and relatively younger, lighter areas. Both are heavily cratered, but the lighter areas are also covered in grooves and ridges which suggest tectonic activity. Over time Ganymede's crust appears to slowly flow, so its craters are rather flat. The oldest ones have lost all relief, and the remaining discolouration is called a palimpsest. 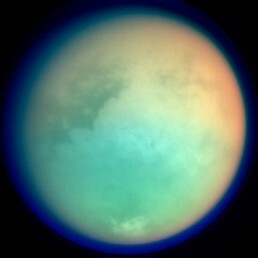 titan, the largest moon of Saturn, and the only moon in the solar system with a significant atmosphere. Thick and cloudy, it is mostly nitrogen with high levels of organic chemicals such as methane and ethane. This is not unlike the early atmosphere of Earth, causing some speculation that it may harbour life. Using infrared light and advanced image enhancement techniques it has been possible to glimpse surface features which appear be oceans, rock and glaciers. 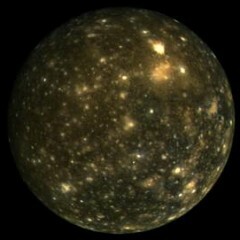 callisto - outermost of Jupiter's four Galilean satellites (so called because they were discovered by Galileo in 1610) - is made up of about 40% ice and 60% rock and iron. It appears to have no geological processes at work, so its extremely cratered surface is the oldest of any body so far observed in the solar system, being essentially unchanged in four billion years. 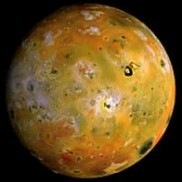 io is unlike any other body in the solar system. Being close to Jupiter (it is the innermost of the Galilean moons) the planet's massive gravity stretches the moon by some 100m and locks its rotation so the same side always faces the planet. But nearby moons Europa and Ganymede peturb it when they pass, making the tidal bulges shift and heating the Io's interior with the friction of the flexing. The resulting sulphurous volcanic activity mean its surface is very young so there are no significant impact craters. 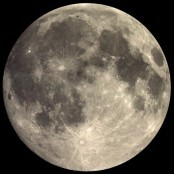 the moon is primarily composed of rock with a small iron core. Its surface is regolith: a mixture of loose rocks and extremely fine dust. Since it is geologically almost entirely dead and has essentially no atmosphere or weather, its features record almost the entire history of the solar system. Like most other satellites, its rotation has become locked in synchronisation with its revolution around the Earth. 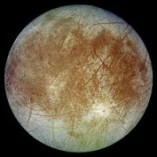 europa is the smallest of Jupiter's Galilean moons. It has a strangely smooth surface, with very few craters, little physical relief, and a global complex of dark, fault-like lines. One possible explanation of this apparently young, active terrain is that beneath its icy surface Europa has oceans of water, up to 50 km deep, kept liquid by the heat of tidal friction. This makes it another candidate in the search for life. triton is the only large moon of Neptune, and the only large moon with a retrograde orbit. Its axis of rotation is tilted 157° relative to that of Neptune, so it is likely that it formed somewhere else in the solar system and has been captured into its orbit around the planet. Its unusual orbit loses energy quite rapidly, so it will follow a gradually decaying spiral until eventually it either crashes into Neptune or disintegrates to form a ring. titania, in common with the other large moons of Uranus, is composed of a roughly equal mixture of rock and water ice. Although the cratering on its surface indicates that it is not extremely young, it nevertheless shows clear signs of geological activity. In particular, it has many long, intersecting valleys, and examples of flooded craters. This may be evidence of fracturing due to the varying rates at which its different layers cooled and solidified. oberon, like all of the satellites of Uranus, takes its name from Shakespeare. Large areas of its surface bear extensive geological faulting. However, it is also heavily cratered, with many of the craters being large, suggesting that they were formed during the earlier life of the solar system. It seems likely that Oberon became geologically inactive when the moon was still very young. iapetus is composed almost entirely of water ice. Its colouring is highly unusual in that the forward-facing hemisphere, as it travels along its orbit around Saturn, is extremely dark (albedo 0.04) while the other hemisphere is highly reflective (albedo 0.5). The line between these two regions is very sharp, and the processes which led to this configuration are not properly understood. charon is the largest moon relative to its primary planet in the entire solar system. When it was discovered in 1978 it was realised that images previously thought to be of just Pluto had actually represented both the planet and its huge moon, and estimates of the planet's size had to be revised downwards. Not only is Charon's rotation locked to Pluto, but uniquely the planet's revolution is locked onto its moon. Over the last few years the number of known moons in the solar system has increased at an unprecedented rate. Many still have provisional names like S/2000 J3 which means "third satellite of Jupiter to be discovered in 2000." When more measurements have been made and their orbits are known more accurately the IAU - the official body in control of the naming of stars, planets, satellites, comets, asteroids etc. - will officially recognise their status and name them. By convention the IAU usually accepts names suggested by the sattelites' discoverers, who follow agreed guidelines. For instance, the moons of Jupiter are named after the lovers and descendants of the ancient Greek god Zeus, hence S/2000 J3 is now known as Iocaste. In the tables below, names are based on the publications of the IAU. The majority of the distance and diameter figures are courtesy of the satellite data pages of University of Hawaii Institute for Astronomy, and the remainder are supplied by JPL Solar System Dynamics, who also provided the basis for the discovery data. All data were last updated in November 2004. Pronunciations of the Greek names use anglisised Greek rather than reconstructed Greek. Inconstant Moon is indebted to Kirk Miller, who provided invaluable help in researching the pronunciations.